In the summer of 2017, Kristen Albee, a local mom who regularly attends Pre-K Storytime with her daughter at the Queen Memorial Library in Point Breeze, fostered a connection between the library and a local church. This introduction led to the creation of a unique and exciting new storytime series. 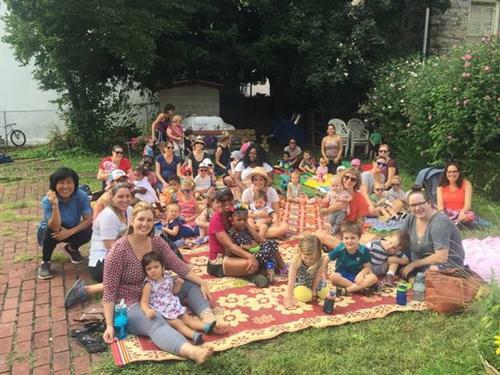 Storytime in the Garden, now in its second year, has flourished through mutual investment by Children’s Librarian Liz Gardiner, and the staff and parishioners of the historic Union Baptist Church at 19th and Fitzwater Sts. in Southwest Center City – the same church Marian Anderson attended! What once was a seldom-used corner plot outside of the church is now a vibrant and productive community space that has been the catalyst for fresh, fun community engagement. Under the leadership of head gardener and organizer Meei Ling Ng (in photo, far left), and with the support of groups such as the South of South Neighborhood Association (SOSNA), the Philadelphia Orchard Project, and Sharon Bank, the church’s sizable garden plot has been completely transformed into a beautiful community space renamed the UBC Garden of Eden. Raised garden beds have been constructed using reclaimed materials (such as bricks from the Royal Theater on South Street and pews from the New Light Beulah Baptist Church) and are filled with fresh produce—from heirloom tomatoes, radishes, and ochre to squash and kale. Flowers, fresh berries, and fruit trees now line the garden’s perimeter, and an arbor has recently been constructed to provide shade and allow grapevines to grow. Future improvements include constructing greenhouses in the church parking lot and continuing to improve the design and bountifulness of the garden itself. Though the process is far from complete, the garden is already a haven for neighbors, visitors, and wildlife. On September 27, 2017, over a dozen families attended the inaugural Storytime in the Garden program. Stories, songs, and movement dazzled the kids and entertained the adults, all in the peaceful garden environment. After scaring away the Big Green Monster and rocking out with Pete the Cat, fresh tomatoes were picked from the vine and shared with program attendees. The first event went so well, in fact, that the library and church agreed to continue the series monthly in warm weather. So far, the morning storytime has never needed to be cancelled due to rain or other foul weather – how lucky! October 17 at 10:00 a.m. will be the final Storytime in the Garden event for 2018. Families are welcome to attend and enjoy a classic Miss Liz storytime experience, followed by a seasonal craft. Come see what all the fuss is about! Stories, songs, and movement dazzled the kids and entertained the adults, all in the peaceful garden environment of Union Baptist Church, during a Storytime in the Garden event. Add a Comment to South Philly Storytime Partnership Blooms – Literally!